Through choral song and spoken word, Amphion Choirs annually presents what we like to call a Dynamic Vocal Event. 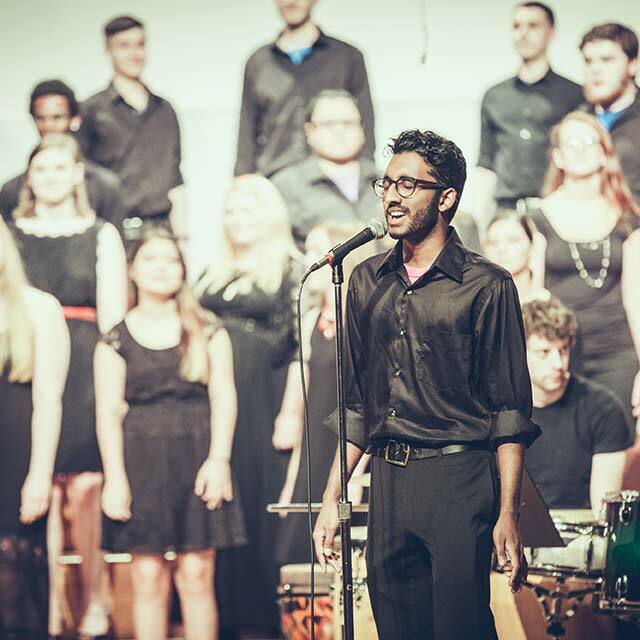 Our performances consist of World Music, works by Contemporary Composers, and Popular Song. Amphion is an Austin-based community of musicians aged 15-23 years old. Amphion is committed to producing a series of innovative concert experiences throughout the year. Amphion Choir presents a thematic exploration we call a Dynamic Vocal Event each summer that weaves cultures, styles, and wisdoms expressed through music and spoken word into a soul-stirring affirmation of music’s transcendence. We seek to be ambassadors for contemporary choral music through education and outreach to communities that might otherwise be unaware of what modern choral music offers. We present short camps that introduce the joy and majesty of choral music along with our enthusiasm. We are building a year-round program of seasons and groups to create even more interest. In Greek mythology, Hermes used his ability to span the mortal and divine to teach Amphion the power of music. Amphion then used music to slide stones into place to create the citadel of the great city Thebes. In 2009, Steve White wanted to go beyond the traditional repertoire covered in high school and university curriculum while giving top young vocal talent a way to develop over the summer. He modeled the program after groups in Canada, Europe, and Africa that specialize in contemporary compositions from across the world. Inspired by how Thebes was built by music, Steve named the program Amphion Youth Choir. Steve White continues as our Artistic Director and driving force behind Amphion Choirs. We are excited to see the talent that you could bring to our choir. We have live tryouts scheduled periodically throughout the year. If you are between 15-23 and would like to try out for Amphion Choir then please proceed to. Amphion Choir is a sponsored project of the Austin Creative Alliance, a non-profit performing arts service organization. Contributions made on behalf of Amphion Choir may be made payable to Austin Creative Alliance, and are tax-deductible to the extent permitted by law. Do you like the music you have heard here on the site or even at one of our concerts? If the answer is yes, then we invite you to visit our humble store. Here you can purchase individual performance songs or even the entire concert. We also have gig artwork available. "A native of Round Rock, TX, Courtney Kelly graduated from Baylor University with a major in Choral Music Education. While at Baylor, She was a member of the Baylor A Cappella Choir, under the direction of Dr. Donald Bailey, and studied voice with Dr. Robert Best. Courtney has been an active choral clinician and adjudicator throughout the state, holding memberships through TMEA, TCDA, and TMAA. From 2016-2018, she served as the first Region 32 Middle School Vocal Coordinator. For the past ten years, Courtney has served as the head choir director at Canyon Ridge Middle School in Leander ISD. She leads a program of over 300 students. Her choirs have received numerous state and national accolades, including a 2017 TMEA Invited Choir performance." TICKETS ARE ON SALE NOW FOR THE 2018 SEASON.